It is in the best interest of the owner to seek a consultant familiar with the numerous pitfalls associated with taking a design from bench scale to full scale. EE has witnessed many such circumstances ending in dispute. As the Engineer and the contractor battle over who is to blame, the Owner suffers. EE will design your treatment process with over 20 years of solidification/stabilization field experience in in mind working with contractors to provide solutions that meet regulatory requirements and are palatable to contractors. The overall result is a successful project with a lower cost. A well designed treatment process ensures all parties walk away from the project winners. Elohi Engineering, LLC is available to support other consultants. Engineers often seek teaming arrangements to help select the best soil treatment process, developed specifications, perform treatability studies, or manage contractors. EE will assist your firm in developing the most cost effective treatment process for your site and ensure that your client receives the most for their investment. Elohi Engineering, LLC will perform an evaluation of the solidification/stabilization process for your project to determine if the treatment process may be reproduced in the field with equipment that is readily available. Often, a proposed design and/or treatability study does not take into account all of the variables associated with performing a treatment process in the field. In some cases, it may be impossible to reproduce a treatment process performed in a laboratory with equipment that is readily available. As a result, it is often difficult to meet the performance criteria outlined by the project specifications and the contract. This may lead to increased reagent usage above what was bid for the project, increased schedule, and significant cost overruns. It is important to perform a careful analysis of the treatment process prior to bidding a project so the risk of cost overruns associated with the field application of a bench scale treatment process may be incorporated into the bid. As many contractors in the business will attest, sometimes the specification and/or contract for a project introduces too much risk to the contractor and it may be in their best interest to not bid or to make certain technical qualifications in their proposal that will reduce the risk associated with the bid. In addition, when the contractor is required to guarantee the performance of the treatment process, it is in the best interest of the contractor to perform their own treatability study to verify the Engineer’s treatability study will perform as expected in the field. 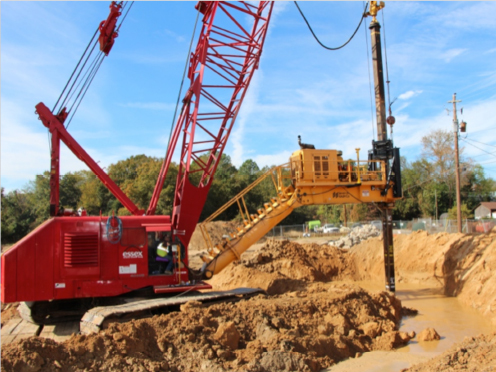 During soil remediation projects, EE will manage the proposed treatment process to maximize production and meet the performance criteria. Each soil remediation/solidification/stabilization process has many variables that must be managed to maximize production and still meet the performance criteria. These variables often change may times throughout each day and must be evaluated continuously to ensure the treatment process will produce a treated material that will meet the performance criteria. EE’s experience on a multitude of projects allows us to constantly make changes to the treatment process, where needed, based on experience. Carefully managing each treatment process will increase the likelihood that prescribed performance criteria will be met and the project will produce a profit. On site engineering experience from dozens of solidification/stabilization projects nationwide. A clear understanding of the solidification/stabilization process and the variables that effect performance. A clear understanding of treatability studies, how they are commonly performed, and the common disconnects between bench scale test and full scale implementation. Significant experience using all of the most popular in-situ and ex-situ solidification/stabilization equipment and knowledge of their limitations.